Badly designed bikeways and roads confuse motorists and cyclists alike, endangering lives. KeepLAMoving members include avid cyclists as well as recreational riders, and leaders who have spent years advocating for bikeways throughout numerous communities in LA County. We love the idea of improving streets, however as safety advocates we cannot stand by as the data shows the new layouts Councilman Mike Bonin has installed in and around Playa del Rey and along Venice Blvd are more dangerous. These changes are giving a black eye to the bicycle movement, creating backlash against Vision Zero, and will cause citizens to assume that all future such projects in LA are this ill conceived. But more than just endangering a movement, Bonin’s efforts are endangering lives. His plan in PDR includes bike lanes that are poorly marked and end abruptly. In fact, Bonin actually ruined what was once one of the most pleasurable rides in LA. 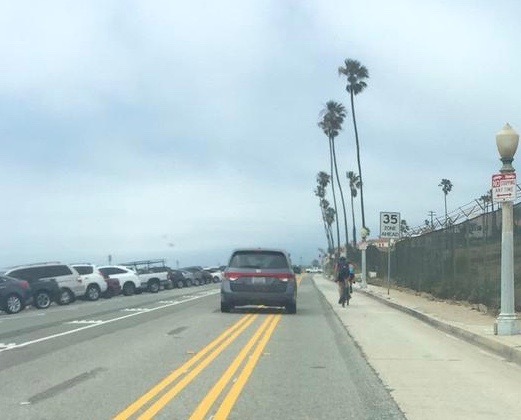 On Vista del Mar, weekly pelotons and individual cyclists had room to ride on a four-lane road where motorists had ample space to pass. Bonin took that away when he removed two car lanes and replaced them with diagonal parking plus an access lane, and u-turn pockets along this high-speed secondary arterial. In Mar Vista, the path he installed along Venice Blvd. confuses drivers and cyclists alike with its nonsensical placement between parking spaces and the curb. Passenger doors open unexpectedly and inexplicably onto the bike path. Even those among us who don’t ride understand the need for safe bikeways. And we all recognize unsafe road configurations, such as the ones Councilman Mike Bonin has installed in and around Playa del Rey and along Venice Blvd. There are a number of street treatments possible, however there was never an opportunity to get the engineering right. It just showed up one day. We urge the city to take a step back to focus on safety, sound engineering, and public input to get this right for PDR and the reputation of future vision zero projects. We need lanes and routes that don’t endanger cyclists and create a false sense of security — especially for inexperienced riders. We need safe bikeways that encourage more people to ride and that foster good relationships with motorists. Removing lanes from arterials is punitive toward drivers and encourages road rage. Especially when Class 1 dedicated paths already exist adjacent to the affected roads, as is the case with the Dockweiler and Ballona paths. We recognize that commuting by bike is not realistic or even possible for many people in L.A. There are people with physical limitations, the elderly, people taking children to school or activities, and those with schedules that would force them to ride after dark - especially in winter to name a few. It’s not fair or wise or visionary to take away high-traffic lanes in a city that doesn’t provide viable, timely transportation options.